FUKUSHIMA UPDATE | What Is The Actual Risk for Pacific Coast Residents from Fukushima Radiation? It is very difficult to obtain accurate information on the dangers from Fukushima radiation to residents of the West Coast of North America and Hawaii. On the one hand, there is fear-mongering and “we’re all going to die” type hysteria. With the first plume of water carrying radionuclides from Fukushima due to hit the U.S. West Coast any day now, [the senior scientist at the Woods Hole Oceanographic Institution, Ken Buesseler’s] latest project is to convince the federal government to monitor radiation levels in the sea water. Buesseler also talked with U.S. Sen. Edward Markey, D-Mass., who agreed the federal government has a role in making sure the oceans are healthy and safe. But Markey said in an email that an increased federal role is not likely [because of budget cuts]. I completely agree that no radiation has been seen in the regards that we’re not really testing for it [laughter] in any organized way … We have very few data; it’s not really being organized. The government says we don’t really need to do that because we’re predicting very low levels. On the other hand, you could argue I’d very much like to see study on our side of the ocean just to confirm these values and build some confidence with the public that’s been concerned about this. They’re right to be concerned — as scientists we’re telling them they shouldn’t be, but it’d be nice to have a few more data points to fill that gap … I’ve been told that there’s very little testing going on. But people don’t know where to get accurate information on the risks involved. I. Is Low-Level Radiation Dangerous … Or Harmless? II. How Much Radiation Will We Be Exposed To? III. How Can We Protect Ourselves from Radiation? You may have heard different claims about whether low-level radiation is dangerous … or harmless. Doug Dasher, who [teaches] radioecology at the University of Alaska Fairbanks, said it remains possible that there will be minor effects for people on the U.S. West Coast, despite the low test results. What is Dasher saying? That even low levels of radiation from Fukushima can increase the risk of cancer and other diseases. The human body is born with potassium-40 [the type of radiation found in bananas] in its tissues and it is the most common radionuclide in human tissues and in food. We evolved in the presence of potassium-40 and our bodies have well–developed repair mechanisms to respond to its effects. The concentration of potassium-40 in the human body is constant and not affected by concentrations in the environment. There are 2 ways that Fukushima radiation has traveled from Fukushima to Hawaii, Alaska, Canada, Washington, Oregon and California: (1) by air; and (2) by water. About a third of the airborne lead particles recently collected at two sites in the San Francisco Bay Area came from Asia, a finding that underscores the far-flung impacts of air pollution and heralds a new way to learn more about its journey across vast distances.In a first-of-its-kind study, scientists from the U.S. Department of Energy’s Lawrence Berkeley National Laboratory and the California Air Resources Board tracked variations in the amount of lead transported across the Pacific over time. In fact, the jet stream passes right over Japan. The jet stream was noticed in the 1920′s by a Japanese meteorologist near Mount Fuji, and the Japanese launched balloon bombs into the jetstream to attack America during WWII. Health Canada (the department of the government of Canada with responsibility for national public health) notes that – while people may naively assume that radioactive plumes are weakened and diffused before they hit the West Coast – there can be “sharp features” with higher concentrations hitting North America in certain areas. This has happened, to some extent. For example, radiation from Fukushima was directly deposited into the kelp off the Western coast of North America … especially in Southern California. Fish that eat the kelp have also gotten exposed to the radiation … as have the animals that eat those fish. Moreover, Seattle residents may have been exposed to some Fukushima radiation soon after the accident. Analyses of (131)I, (137)Cs and (134)Cs in airborne aerosols were carried out in daily samples in Vilnius, Lithuania after the Fukushima accident during the period of March-April, 2011. The activity ratio of (238)Pu/(239,240)Pu in the aerosol sample was 1.2, indicating a presence of the spent fuel of different origin than that of the Chernobyl accident. (“Pu” is short for plutonium.) Fukushima is 4,988 miles from Vilnius, Lithuania. So the plutonium traveled quite a distance. Tepco – the operator of the Fukushima plants – has been pouring tons of water on the reactors every day. So this is helping to keep the aerial releases down. However, the Japanese government has embarked on a massive program of burning radioactive waste throughout Japan. This is idiotic … and is releasing some radiation into the air. In any event, unless the Fukushima fuel pools collapse – or the government increases the amount of radioactive materials which it burns – the air will not be the main route for the spread of radiation to Hawaii or the West Coast. The jet stream can carry radiation through the air from Japan to the West Coast, as noted above. A similar dynamic is present in the water, as well. 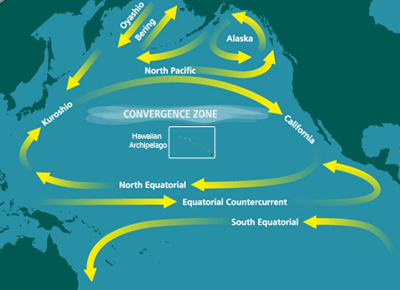 Transport by ocean currents is much slower, and additional radiation from this source might eventually also be detected in North Pacific waters under U.S. jurisdiction, even months after its release. Regardless of slow ocean transport, the long half-life of radioactive cesium isotopes means that radioactive contaminants could remain a valid concern for years. Below, we will tell you that some radiation has already reached the West Coast … and we will show you some future projections for radiation. As such, all of the models drastically underestimate the amount of radiation which West Coast and Hawaiian residents will be exposed to. In addition to Cesium, Fukushima has pumped out an enormous amount of Iodine 129 into the ocean: approximately 8 billion becquerels. Iodine 129 has a half-life of 15.7 million years. It has also released a lot of strontium 90. In the first 3 months alone after the earthquake and tsunami, Fukushima dumped between 90 and 900 trillion becquerels of strontium 90. The accidental radiation releases have been enomrous. But Tepco is apparently planning on dumping all of the radioactive water stored at Fukushima into the ocean. Scientists at the University of Alaska are concerned about radiation leaking from Japan’s damaged Fukushima nuclear plant, and the lack of a monitoring plan. Some radiation has arrived in northern Alaska and along the west coast. That’s raised concern over contamination of fish and wildlife. John Kelley, a professor emeritus at the University of Alaska Fairbanks, says he’s not sure contamination will reach dangerous levels for humans but says without better data, who will know? The Department of Fisheries and Oceans — the Institute of Ocean Science … program which is a time series program that monitors the chemistry and biology of the North Pacific that’s headed up by Maria Robert. 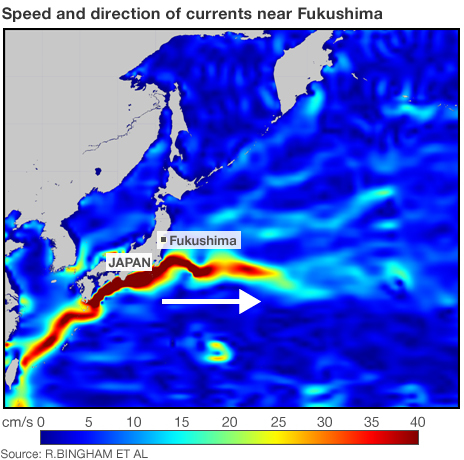 They’re making measurements of these Fukushima-source radionuclides offshore, and they’re starting to detect the presence of the plume of radioactivity. Bluefin tuna on the California shore have already tested positive for radiation from Fukushima, and there are reports of highly radioactive fish in Canada. The government isn’t adequately testing radiation levels in the ocean, seafood or air. So it is vital that we contact our government representatives and demand that they thoroughly test for radiation … and publicly release the information. In addition, there are easy, inexpensive and healthy steps we can take right now to help protect ourselves against radiation. It is time we started talking about KR 85 and I 129. I 129 has an over 15 million year half life and could be the reason that Japanese children are already getting thyroid cancer. How much excess is coming from the accident. Kr 85, scientists have known since 1972, is building Earth’s negative field and may result in the build up of electrical feed back loops by 2020, which means to the best of my understanding it can come right down to your outlet. Someone needs to verify this and write about it. I read that it has increased K% 85 14 K times, is this correct? Are we talking about having to shut down the power grid? Is the radiation going to be so high in the Pacific in 10 years we can not drill for oil in the area? Should we not have waited three years to assess what this is going to come to in ten years? Is not the decision to give Japan the Olympics in 2020 recognition of the dire state of denial of world leaders? Governments had no trouble scaring us over nuclear power and fall out in the 40s and 50s when it helped them make us understand the Cold War. Why is fear mongering OK for one purpose and not getting us ready for this? Every government should be passing legislation to allow animals like chickens and goats in back yards and tax incentives for home gardens that feed more than the grower. According to this blogger, SFP4 was already empty a few days after the quake in 2011. If so, TEPCO is pretending to remove the spent fuel rods that had already been burn in the zirc fire… Decide for yourself. Breathtaking ignorance at all levels of society appears to be sealing the fate of the biosphere. People have their reasons to deny all of this. It is too unbearable for families with young kids to even consider this subject although the evidence is right in front of them. Power elites have their own reasons for the denial. The quest for profit supersedes any concern for the planets’ environment. One argument is that even if you know the dangers, what can you do about it? For starters, we could be smart enough to outlaw any further nuclear propagation. Doesn’t look likely. Move to southern hemisphere? It has been contaminated already for decades. Above ground testing, uranium mining and so forth has been going on down under for quite awhile now. We can run but we cannot hide. will reject their right to stay as squatters and disputes and bloodshed are inevitable results. expert civilians with previous AEC or military, or scientific expertise. Let’s do it now. Just information from my experience, in southern Utah and northern Arizona desert areas I have studied and sampled a creature called Triop for some few years, this past year all or nearly all of their life cycle has been interrupted, their eggs do not hatch. Within the past month I experienced effects from radioactive fallout in the skin of both forearms. I spent about three hours this week getting seed from some rabbit bush plants and had been stepping in moist soil from recent rain, and on return home experienced a notable coldness in the bottoms of both feet, I am taking available countermeasures. We have been using potassium iodide since the events beginning in March 2011. Just FYI Thank you. I expect that the possible exposures are enhanced or concentrated because the triop live in rainwater ponds with no outflow, and the muddy soil around the rabbit bush was from over 24 hours of continuous rainfall in the previous week. In speaking to a cattle man in that area, he was unaware of noticeable fallout. There has been some reporting from other areas of beef carrying noticeable levels of nucleides and just a few cattlemen who have become aware of it are including boron with supplemental feed. It snowed here the night before last. I removed snow from my pickup, and now notice a small skin lesion on the right arm which did contact the snow, abut 12 hours ago. I am considering that there is something to be dealt with now in the environment at least in the event of concentration due to rain and snow, and ponds consisting of precipitation becoming collected. The need for precautions makes sense, and I do not believe panic is in order, just becoming informed.